← What is your primary leadership style? Finding great talent or being a great talent yet to be discovered are two sides of the coin George Anders addresses in his book, The Rare Find: Spotting Exceptional Talent Before Everyone Else. Needless to say, finding great talent isn’t easy when all sides are trying so hard to avoid making a mistake. Let’s take Steve Jobs. He’s our example above. 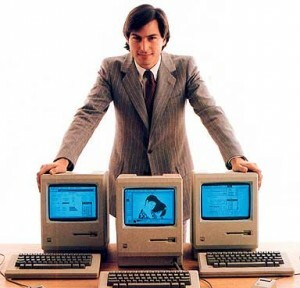 George writes about how Jobs had a “jagged resume,” of success AND failure. Of course, most people airbrush their resumes to downplay their failures. They have to because the hiring manager doesn’t want to risk making a mistake. Yet, George says understanding how someone succeeds after a setback is key to finding superb talent, which we all know Steve Jobs did brilliantly. We asked George some questions to help facilitate hiring managers and ‘rare’ talent finding each other. SuccessTelevision: You said, “Find the frontier. If you want to be extraordinary, restlessness is a virtue. It’s also a great traveling companion for resilience; if you can combine the two of them, your chances of finding society’s greatest opportunities in any particular decade are huge. Hang out with people just as driven and passionate as you.” Can you elaborate on how we can join one of these ‘hotbeds of talent” Does this mean be an entrepreneur? Hang out with people with similar passions? George: “If you’re in a big organization, try to get transferred into the areas where the most ingenious people are working. This may not be the long-time, high-prestige areas. It may be the emerging market where your company is just getting started, ramping up. It’s more likely to involve the product of the future, rather than the product of the present or the past. SuccessTelevision: How should a company or an HR person go about finding great talent when they are in the hot seat for not failing or choosing poorly? SuccessTelevision: You write about Steve Jobs and his “jagged resume”. What questions would you ask someone or what would you do to find that this person was actually a star? SuccessTelevision: How can someone make sure the other side of the table, company or HR, understands that they’re a great talent? Ask the recruiter or hiring manager if he or she has ever considered some striking new approach — which ought to be way smarter than what the company is doing right now. Establish your priorities — in a good way — go way beyond making a bunch of money for yourself. Figure out some way of getting across the point that what really excites you about the opportunity is the chance to work with some rare and crucial tools so that you can do a better job. The basic point: Great talents want to work with the very best technology so they can surpass what anyone else is doing. That matters more than vacation time, the dental plan, etc. I remember reading how ace director Brad Bird was excited about joining Pixar in 2000 because they had some 3-D animation software that he’d never had a chance to use before. This entry was posted in HR, IN, Innovation, management, Team building and tagged big challenges, brad bird, building teams, crave big challenges, finding career opportunities, finding great talent, finding peak performers, george anders, getting a good job, getting hired, hiring mistake, hiring strategies, hotbeds of talent, how to get promoted, how to succeed at work, jagged resume, job hunt, job opportunities, making a mistake, passionate pursuits, pixar, resilience, spotting exceptional talent, steve jobs, succeed after a setback, talent acquisition, talent hunt, the rare find, understanding job candidates' passions, unsolved problems. Bookmark the permalink.